Our student interview today is with Cristina Delgado. She’s 30 years old and originally from Colombia; our always-smiling lawyer came to Lisbon seeking a quiet city where to learn Portuguese. She was born in Pasto where she lived until she was 17, she then moved to Atlanta for one year and moved back to Colombia to study in Bogotá where she actually lives! She can work remotely from everywhere in the world and intrigued by Europe she decided to give a try to Portugal. There was something charming about this country and she wanted to know more about it. The morning at Portuguese Connection starts with Cristina arriving late (sometimes :) ), drinking her coffee, grabbing her tea, telling a lot of interesting and funny stories and, of course, playing with Maggie. She said to us she would like to move to Lisbon to live with her “sobrinha” (niece) Maggie, our dear mascot with her in the picture. Her favorite Portuguese word is “saudade”, she says that this could sound too obvious but she was too intrigued by the untranslatable word that she couldn’t help falling in love with it! We interviewed her last week to know more about her and about the reason why she decided to undertake 12 weeks of Intensive Group Classes at Portuguese Connection! 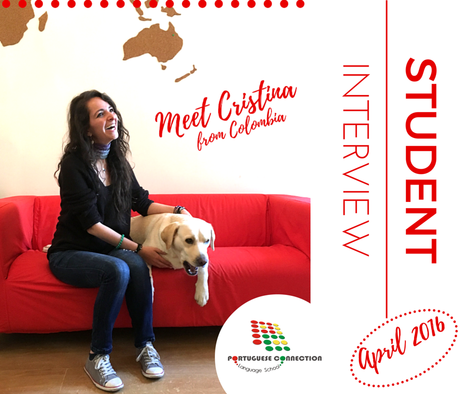 Meet our lovely Cristina through her own words! I think Portuguese Connection is the best school in Lisbon. I love the teachers and the classes, I have already made good friends, and I feel them as my Portuguese family. Lisbon is the most amazing city, and Portugal the most sweet country. It is different, than Colombia. It is calmer and people are quite calm. You can feel the good energy and the colors of the city, since the moment you arrive. My life here is amazing, is calm and nice. I'm working remotely from Lisbon, and on my free time, I enjoy reading by the river, walking through the city, and having dinner out. I've been in Portuguese Connection since the second week of March, and would stay until the last week of May. I'm attending a nice course, B1. I like my classmates, and also I have the opportunity to learn about other cultures. 5. What do you think of your classes and your home stay accommodation? I think I could not have been any luckier, about my host family. Anita and Zè are amazing and good people, always trying to help me by improving my Portuguese skills. I love them, and I just hope they keep in touch after I leave. As well, with my Portuguese Connection family. I have the most pretty niece ever (a gorgeous doggy) who I love so much, and I really hope to share more experiences with my niece and my dear friends (Joana, Annalisa, Marco, Ivan, Carla, Sofia, Ana, and my classmates). I have learned way more than I was actually expecting. I have learned about cultures all around the world, about Portuguese history, about politics, about everything. So far, I love the experience! I wish I can stay longer. If so, Portuguese Connection would be my school to keep improving my Portuguese.